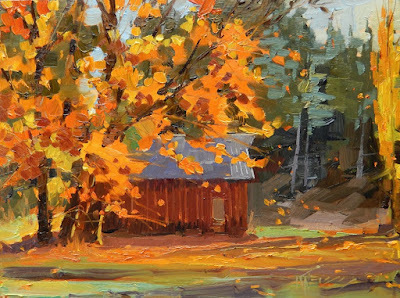 This is the last work from the 2017 Fall Paintings folder that were not posted in 2017! The Red Barn sits right next door to the Knowles Studio where I work. It's fun to watch it change through the seasons but I like it best in the fall with the changing color of the trees. Someday like most of the old barns in our area it will succumb to time and weather. It's nice to preserve their character on canvas.